“Immigrants make billions of dollars for the fast food industry, yet at the same time we are forced to live in fear in our jobs and in our communities,” said Adriana Sanchez, a fast-food worker. 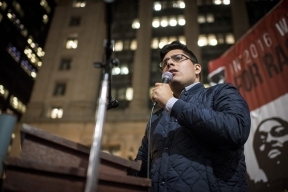 “It’s time for immigration policies change because we need to be able to live without being terrorized and mistreated. 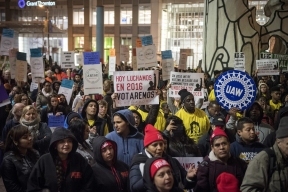 That’s why in 2016 we will only vote for those candidates that support $15 and union rights, but also those who support immigration reform with a path to citizenship.” Supporters of higher wages announced that they are taking their Fight for $15 to the ballot box to demonstrate to legislators that these issue cannot be ignored. A recent poll of low-wage workers commissioned by the National Employment Law Project showed that 69 percent of unregistered voters would register to vote if there was a candidate who supported $15 an hour and union. 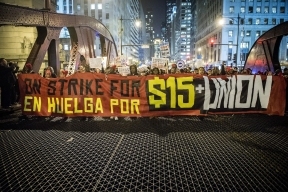 In the last month, workers have conducted meetings in and around the city, demanding “$15 by any means possible.” Over the course of next year, the Fight for $15 plans to mobilize voters around the issues of higher pay, union rights, and quality child care, and immigration reform. 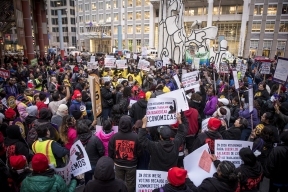 Low-wage workers who have won the fight for $15 an hour occurred in New York and Los Angeles. Additional rallies in Chicago are planned for the coming weeks.